Spikes Asia may be seen as three days of inspiration and drunken nights, but this year you will collect more than awards and contacts. There is an opportunity to learn and grow your job skills with specialist sessions. 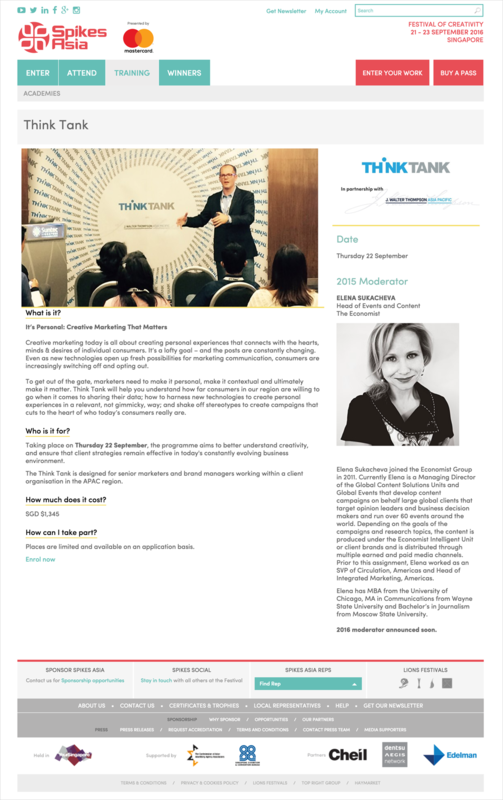 In association with J. Walter Thompson, Spikes is presenting ‘The Think Tank’. This is aimed at senior marketers and brand managers working in client organisations. ‘YouTube Creative Hack’ will offer an opportunity for those under 30 to create a mini-campaign within a day. Also for those under 30, there are five ‘Young Spikes Academies’ sponsored by Cheil, each encompassing a different career discipline. Each one is led by a seasoned professional aiming at account executives, marketing executives, designers, digital specialists, and media executives. It makes one wish to be under 30 again! Indeed, one can think of several people in their forties who would benefit from this extra bit of training. Grey advertising is supporting the ‘Young Spikes’ competitions this year. The participants have two-days in which to create innovative campaigns across Integrated, Media, Digital and the ‘Student Creative Award’ for Print. Is there someone in your agency who would be tested and encouraged by taking part? Help them and your firm by putting them forward. Spikes Asia Festival of Creativity will be held on 21st-23rd September 2016 at Suntec, Singapore. Delegates can still register and more information about the Festival is on the site www.spikes.asia.